If you’ve always dreamt of going freelance but don’t know how to decide what business to start then read on as there is a very simple technique you can use to show you the way. You can use it to help you discover what you are interested in, like to do, and that others will find useful, therefore giving your idea the best chance of success. There are many free tools and processes you can use to come up with the best freelance business ideas, so if you’re thinking of taking the plunge into the freelance world and quitting your day job, then this article is designed to help you do just that. Focussing on what inspires you and what you’re passionate about will make sure you’ll be interested in what you decide to do enough to build the business over the long-term. Believe me when I say you’ll be eating, sleeping and breathing your business 24/7 so it’s important you love it and won’t mind. This is why choosing the best business idea for you is really essential. You may already have your idea, or have many, but the following steps are really useful to go through to make sure you’ve really made the best choice. So to give you an example of how it’s done, I’ll show you the simple method I used to come up with the idea of Inspired Camping. Then I investigated the markets and any trends coming out of these passions, fears and problems and researched how competitive they were. I did this using a number of tools available for free for anyone to use. It wasn’t long before I began to develop a picture of what I wanted to do and where there was a gap in the market. I find Google simply amazing. They make so many amazing tools available for people to use for free. Google trends is one of these and allows you to research and compare trends visible through search queries being used by people worldwide or in individual countries using the Internet. This includes top regions and cities where people are from and related keywords and emerging trends. 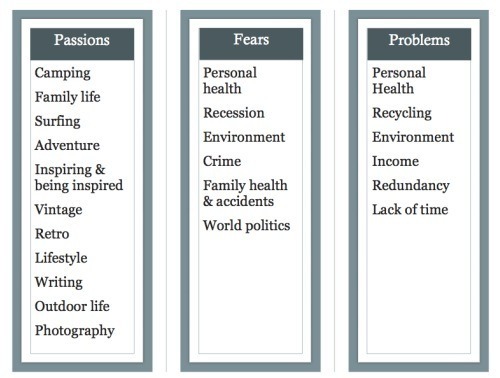 This helps with identifying keywords to focus on as well as trends. All essential if you want to know who your potential audience will be and therefore how best you can find and communicate with them. Another free and simply fantastic tool that allows you to compare different search terms users are searching for when using the Internet is Google Insights. This is particularly valuable for those wanting to have a big influence online. Yes surprisingly enough Amazon can be a great tool for researching what customers are saying about a particular service or product. Once you’ve found what you’re looking for simply look at the customer reviews to build a picture about what’s being done well and what isn’t. It may also give you an understanding of what people want but can not get. Plugging this gap in the market is key to success. If you’re thinking of building an app, or backing the development of one, the best bit of research you can do is within the app marketplace itself. iTunes and Android, etc. have essential information for you. They tell you what’s already out there, what they do well, what they don’t and how a better product can be developed. Many people make a great living doing this, and if done well it can be very lucrative. Finally, the best and most valuable tool I continue to use today, is Market Samurai. This is not a free tool but when you consider the time it saves and the benefits it brings it is definitely one of the most valuable tools available to businesses that understand they need a strong online presence to succeed. Basically this tool allows you to investigate the market of your potential business, study the competition, choose the best keywords, monitor your business website ranking, assist with your website content and help your publicise and make money from what you do. They even give helpful tutorials to make sure if you don’t know what you’re doing then you can learn. It’s one of the best investments I’ve made and it continues to shape my online journey on a daily basis and saves me a heap of time.